Estonians can do anything if they put their heart and mind to it. 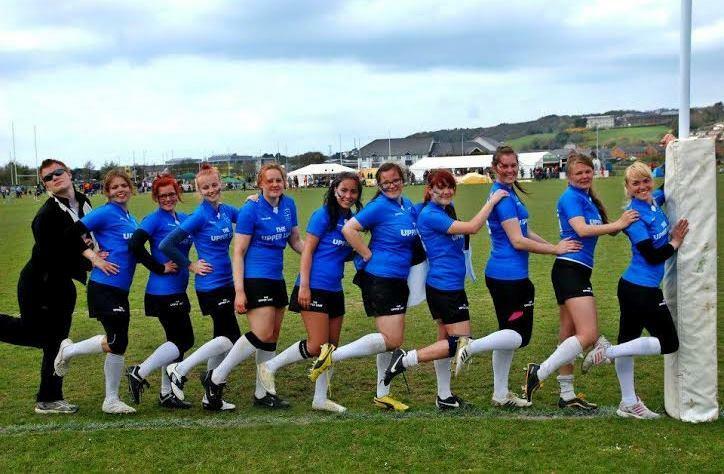 Thirteen Estonian girls who learned to play rugby in three months and participated in the Rugby 7s tournament held in Wales are a living example. Aberystwyth is a small university town situated on the coastline of Wales. There is a growing number of Estonians studying in this multicultural but not so widely known university. As it is almost inevitable in a foreign country, Estonians end up running into each other. Aberystwyth has a small community of my countrymen who honour traditions and come together to celebrate national holidays. This is something that is also common for the Welsh; they are a small nation very keen on preserving their language and traditions. 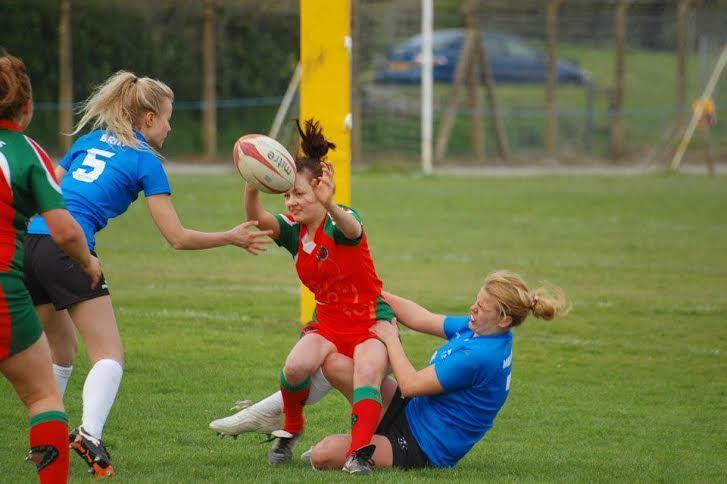 While living in Aberystwyth it becomes rather clear that rugby has a very important place in the Welsh culture. 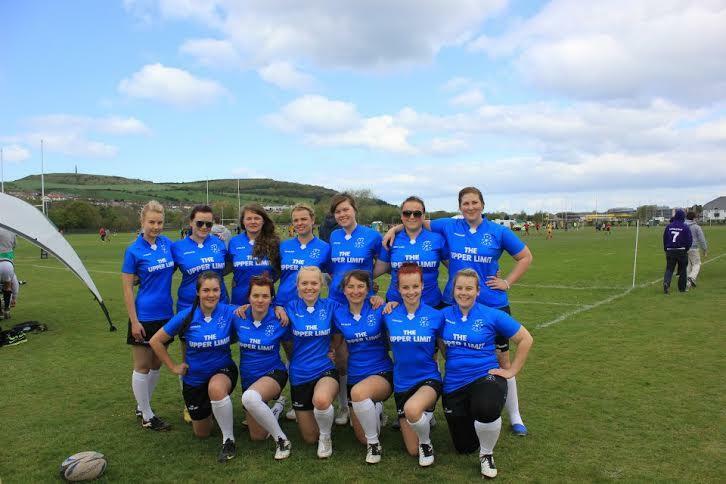 Rugby 7s is annually held in Aberystwyth and it is the highlight of the year. 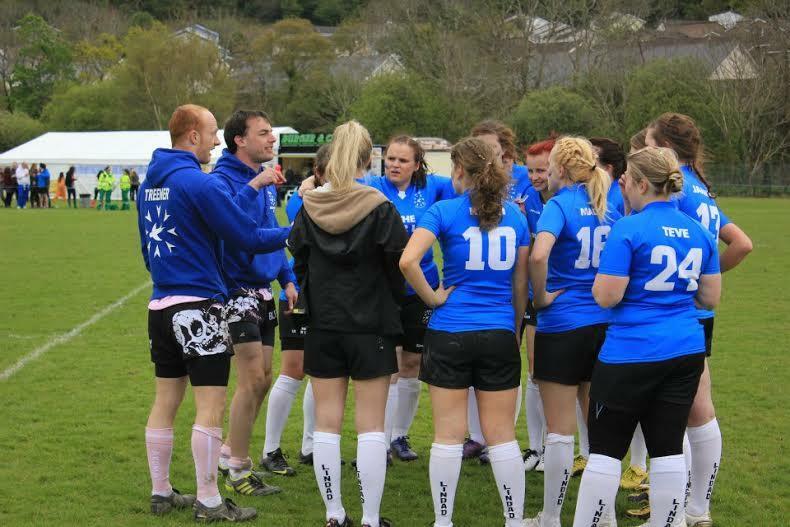 Teams from different parts of the UK gather to Aberystwyth for the first weekend of May to participate in the tournament. This event is extremely popular among students; many continue to return for years after graduation. 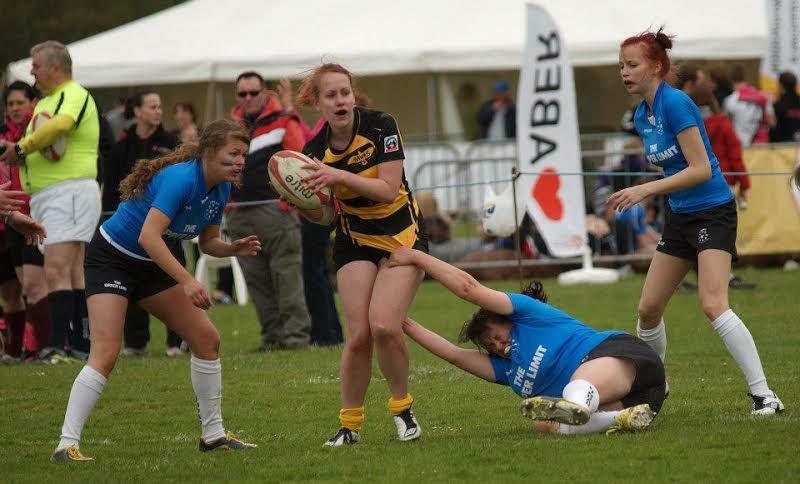 In 2012, after we had attended two Rugby 7s tournaments as viewers, we decided that Estonian girls are tough enough to compete with the participating teams. In order to register for the tournament at least seven players need to be in the team. It turned out that the fear of not having enough brave Estonian girls was needless – we ended up having 13 members in our team (14 is the maximum). We also had to find a coach who would actually know something about the game and would be ready to train us for free. We were lucky to find not only one but two dedicated volunteers – James and Hugo. The name often used by the Estonian sports teams is Kalev (it is the name of the father of the hero known from the Estonian national epic), so in order to relate to the national nature of the team, we called ourselves Lindad, after the mother of the hero – Linda. The first practice took place on a small grass ground behind one of the buildings of the university. Both our coaches were there. This also happened to be the first time we held a rugby ball. At first even the basic exercises were confusing, mainly because the ball had to be thrown backwards, not forwards. Our British coaches probably left the first session thinking that their main task is actually to ensure that we are alive in the end of the tournament. Since the majority of us had never managed to figure out the rules of the game, they made it compulsory for us to watch rugby games. In order to make sure that there was an educational dimension, they joined us and patiently answered all the questions we had. Despite the bad weather that accompanied us through most of our training sessions we continued to practise. We were motivated by the good company, the dedication of the coaches, team spirit, our national pride and the game itself. As time passed the trainings became more technical. At first we were sure that our secret weapon will be the Estonian language because we could plan our moves during the game without the other team understanding. But as soon as we had our first tackling practice and hence, had to wear mouth guards, we realised that even we do not understand “the planned” moves. 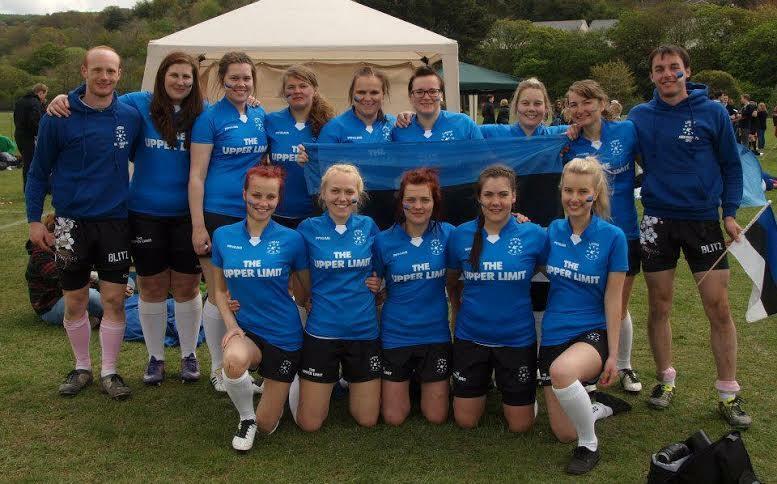 Before we knew it was the beginning of May and time for Rugby 7s. The atmosphere in the tournament is addictive. Everyone is in their rugby kits and there is an overall feeling of excitement in the air. Being a participant in the tournament adds so much to the Rugby 7s that it felt like a totally different event compared with the one that we had been to as viewers. We all loved our blue, black and white kits and were very happy to see all our friends and fellow Estonians who had come to support us. We drew Estonian flags on our cheeks and went to play our first game. Since our coaches were participating in the tournament themselves and there were about six or seven games happening at the same time, we had to manage without them. Nonetheless, whenever they could, they watched our games and instructed us and whenever we had the opportunity we went to see them play. 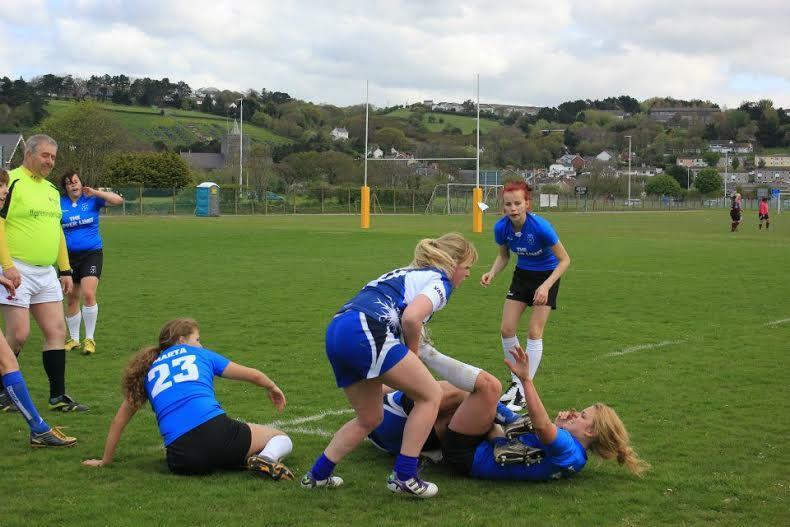 Unfortunately, we also had to encounter the ugly side of rugby when one of our girls hurt her neck in the middle of a game. She had to be put on a stretcher and was taken to the hospital. Fortunately, what first appeared to be a very serious injury ended up being a slight concussion. 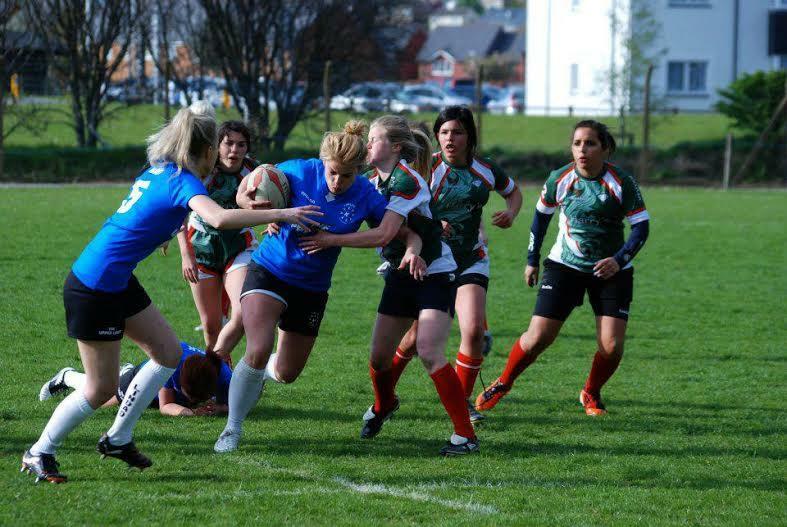 This, however, did not stop her from taking a taxi back to the rugby fields. 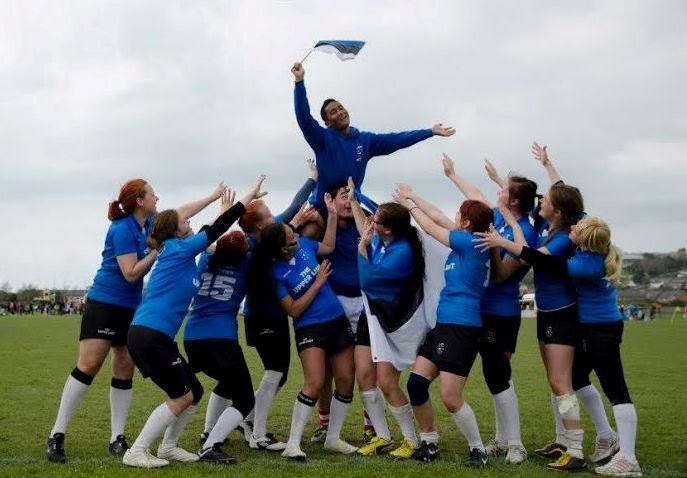 She returned to play despite the rejections from the rest of the team. Everyone else got some bruises and bumps that we wore proudly. Our overall performance in the tournament can be described with the Estonian saying “Algul ei saa vedama, pärast ei saa pidama” ( “slow to start first, difficult to stop later”). Our initial goal was to beat at least one team but by the afternoon of the second day we had qualified for the next round. In the end, we were on the sixth place (from 20 teams). This was way beyond of what any of us dared to dream. Even our coaches, who never stopped believing in us, were surprised of how quickly we managed to pick up the game and how well we ended up playing in the tournament. Those who stayed in Aberystwyth continued to hold the team spirit high. They recruited new Estonians and since James and Hugo left, they found new coaches – Nathan and Matt. They trained and explained the game to the new Lindas. They prepared for and anxiously waited for the next Rugby 7s where once again Lindad managed to offer a competition for the locals. Photos courtesy of Kristi Raidma.